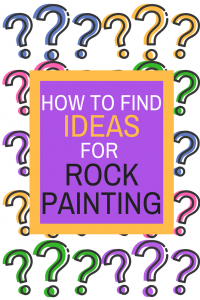 How to Find Ideas for Rock Painting will point you in the right direction for finding ideas for what to paint on stones. There are thousands of things to paint. Finding the right thing to inspire an amazing rock is easy with these ideas. Who isn’t a Pinterest lover? I know I am. I love finding new ideas for all of my rock painting boards. If you follow me here, you will get daily inspiration that will have you bursting with ideas. I have boards full of samples of things like: animals, people, fruit, buildings, transportation, abstract, birds, bugs, flowers, forest animals, garden markers, food and drinks, hearts, mandalas, moon, sky & stars, quotes and words, outdoors, owls, and all the seasons and holidays. If you love learning by video, Youtube is where you want to be. Step by step instructions will teach you to create your own works of art. Take your camera everywhere with you. You never know when inspiration will strike and you find the perfect ideas for your art. Google is your friend. For inspiration enter what you’re looking for like “otters” and add “illustrations.” So you will enter “otters illustrations” and then look only the images. You will find lots of ideas that will give you the nudge you need to make your own artwork. Facebook has several rock groups dedicated to giving you daily inspiration. I just happen to have one myself with over 21,000 members. 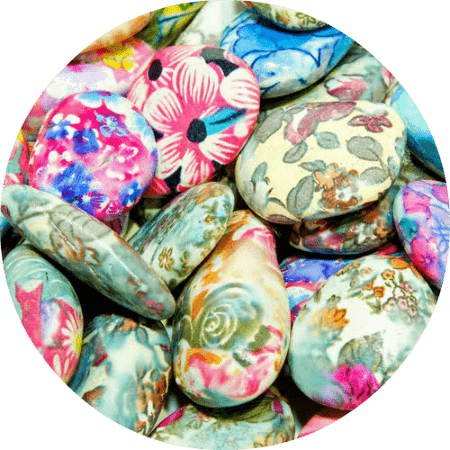 You can join the Rock Painting Ideas and Resources Facebook Group here. Take one idea and paint the item in different ways. For instance if you decide to paint a cat, you paint a cat sitting on a chair, riding a bicycle, holding a mug of coffee and wearing a scarf, paint just the top of his head, wearing a bathing suit, dressed as an angel, paint it in different seasons and in a variety of colors…you get the picture. Let’s go back in time and paint something from each decade, starting from the early 1900’s. You can paint the cars from that era, what the popular toy was, and fashion items are just some of the things you can paint. Pick a letter and go grab your dictionary. Start from the top and go down through the words until one jumps off the page. This is the perfect way to stretch your imagination. Push yourself to capture things that are part of the season. You can pick seasonal fruits, vegetables, drinks, food items, weather elements like leaves in the fall, snowflakes in the winter. There are 50 state birds, flowers, animals and trees. You can also paint things that remind you of each state. When I think of Montana I think of horses, grizzly bears, log cabins, mountains, haystacks, buffalo and snow. Go around the world with rocks. Think of ideas that each country is known for and create an entire set of rocks that represent it. For France you could paint the Eiffel Tower, a coffee cup, a bistro table and two chairs, a French pastry, bottle of wine, and a French poodle. Take two ideas and put them together and see if you can pull it off. This will be fun for the whole family. You write out slips of paper and put them in two bowls. Draw one from each and put them together. In one bowl, put the item you’ll be painting and in the other bowl you create ideas what the painted object will be doing. For instance, you put a list ideas like dog, turtle, sailor, and nurse in one bowl. The other bowl put ideas like running, sleeping, painting, eating or reading. Now combine the two ideas you draw and have fun. The more unusual the activity, the more fun you’ll have. Think of all the ideas you can come up with when you associate them with an area. For a desert, you can paint snakes, adobe, cactus, and camels. A rainforest can include waterfalls, parrots, monkeys, jungle, tigers, and exotic butterflies. A piece of paper and pen is all you need to start doodling different designs. Your home is filled with history from your family, why not use those pieces as inspiration to create an amazing design? Grandma’s teacup and saucer, a sculpture, Grandpa’s fishing hat, or even a cookie jar can be the perfect item to showcase. Come up with a theme and see how many different ideas you can create. You can start with cowboy or cowgirl subject matter and let your mind envision all the rocks like horseshoes, cowboy hat, horses, sheriff badge, rope, cowgirl boots, bandana, and a violin are just a few of the things you can paint that will brings smiles to everyone’s face. Get your exercise and inspiration at the same time. Comb your neighborhood and look for things to paint. Bring along your camera, so you can capture the moment and then go from there. Greeting cards, old calendars, children’s books, and sticker books are just some of the items that will give you the pop of insight you need. You can also attend an exhibit of children’s artwork for inspiration. The holidays will give you more ideas to pick from. Christmas offers Christmas trees, presents, Santa Claus, Reindeer, sleighs, and poinsettias. Valentine’s Day symbols are cupid, hearts, and love notes. Easter has bunnies, eggs, baskets, and crosses. Thanksgiving is turkeys, corn, leaves, and pilgrims. Your childhood is a gift box filled with inspiration. What did you like to do as a child? Fly kites, play with dolls, ride bikes? 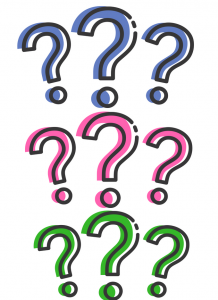 What things were popular when you were young? Capture your memories on your rocks and share them with those you love. We’ve reached the end of How to Find Ideas for Rock Painting. I hope you enjoyed it. Let me know in the comments below how you get ideas for your rock designing. Make sure you sign up for our weekly newsletter. Starting in June, we will be giving away an artist created rock every month and all subscribers to the newsletter are entered to win.